How to write a manifesto. Today, we write a manifesto. Today, our second sentence starts with the first word of the first sentence. We write a short sentence. Then we make our point even clearer. By using fragmented prepositional phrases. By repeating that first preposition. By doing it a total of three times. And then we have another really long sentence that builds up excitement for our overarching concept that is summed up in a word that makes absolutely no sense. 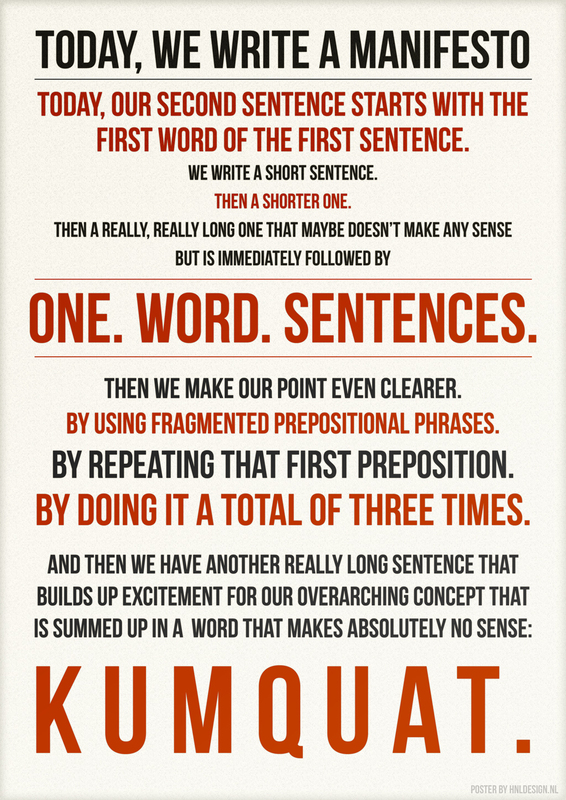 The original Manifesto-manifesto was written by Kim Mok, see it here. the link to the Kim Mok original seems to be broken – can you check and correct? Thanks for the heads up; link fixed. Love it. Thank you for the laugh this afternoon.